Dust Collectors – 1.Toušeňská s.r.o. These devices serve for exhaustion of dust emerging from the blasting process. The necessary power of dust collector depends on the size of a blasting machine; for maintenance of smaller cabins an industrial vacuum cleaner is quite sufficient. Dust collectors with pneumatic cleaning of cartridges are provided for larger cabinets or blast rooms. 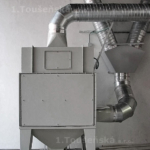 We make and supply a wide range of dust collectors of varied power and number of cartridges. 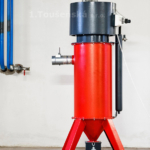 Together with delivery of a blasting machine we will also offer you the most appropriate type of a dust collector. The collectors can be supplemented with cyclone separator of larger particles, which increases the overall efficiency. In some cases they also make it possible to recycle the coarse blasting abrasive back to the cycle.